In order to succeed in projects we are expected to be efficient in our work. Too many people think that this automatically translates as “don’t do anything but work and do everything in a hurry”. That’s not the case. Cut your to-do list in half. Getting things done during your workday shouldn’t mean fitting in doing as much as possible in the sanctioned eight hours. Follow the 80/20 rule. Only 20 percent of what you do each day produces 80 percent of your results. Of course, it’s easy to say this. Be more efficient by working less. But what if you have a lot of mandatory tasks that you just can’t drop? Maybe you should consider automating them. For instance, Sikuli Script is an easy open-source way to automate tedious tasks. Whatever is on the screen, it’s probable that Sikuli can interact with it. 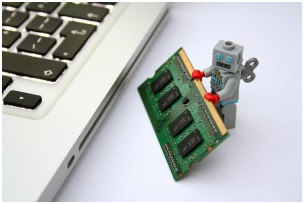 If you have a manual task that could be done by a robot, why not try exactly that? 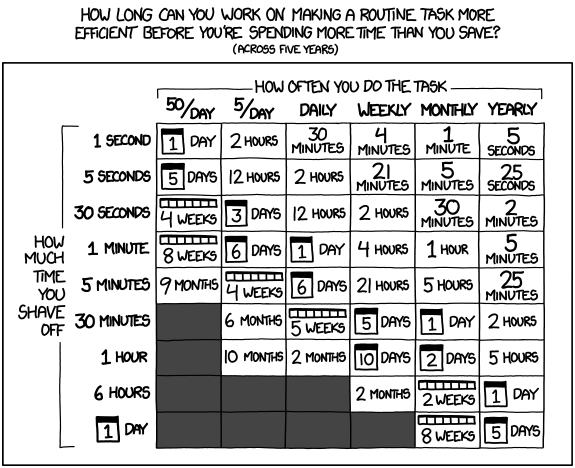 As demonstrated by the marvelous web comic XKCD you can spend a surprisingly significant time on automating your task before you stop saving time in the long run. 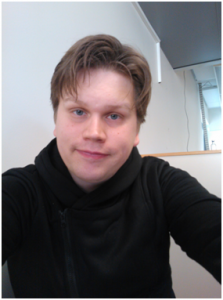 We automate test cases all the time and those cases emulate our real work. Why leave it only at that?